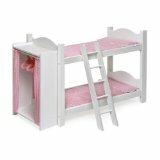 A doll canopy bed is the perfect gift for the little girl that loves to give her babies the royal treatment. It's a given that little girls are going to take care of their dolls in every way. They are going to feed them, change their clothes, take them for stroller rides, and put them to bed. Instead of them finding an old shoe box and making that into a bed for their dolls, they could put their little princesses to sleep in style. These cute playful beds can come in many different styles. They can come in the traditional twin bed victorian or they can come as a crib canopy. The style of the bed probably really doesn't matter to a little girl as long as it is cute and serves the purpose of giving her baby dolls naps. Granted, the naps won't last very long before your daughter grabs her baby up and takes her off for another stroller ride or decides it's time for the baby to change clothes. The best part is that it is a special toy for a special little girl who will be so excited that her baby doll has a beautiful spot to sleep. Not all of these are canopies but they are adorable doll beds that little girls could have lots of fun with.